I am an amateur rock collector and I found these, please help! Fellow Michigander from Niles & have a brother in Manton very close to Cadillac! Nice find! I'm stumped, but very intrigued. The photo isn't quite good enough to see a lot of detail, almost looks like there's a filter on it. It's always a good idea to add as many photos as you can from various angles to give multiple looks & viewing persectives. The feathery lookimg thing is totally bizarre. Almost looks like a piece of wheat grass or something. The specimen on the bottom left has the characteristics of some type of coral. Almost sponge like or perhaps the top of some stalk like coral appendages that typically appear as roundish or sometimes 6 sided shapes. Even nearly perfect hexagons sometimes. 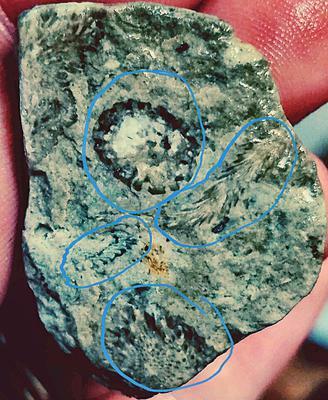 Think of it as similar to a Petoskey stone on a much smaller scale with those shapes clustered together. However, I'm not sure about that, it just has a coral like appearance to me. But the photo isn't quite clear enough and the fossils themselves are quite small, so it's hard to see enough to be able to be able to say anything other than, that particular lower left fossil, has a coral like appearance to it. But I can't be sure. Did you see my other find I posted? I can't identify your fossils but it does look like you have several specimens embedded in this rock. Your part of Michigan is covered with Carboniferous rocks. The one in the upper center of the photo looks plant like, a fern or horse tail. The others I just don't know.